Cake has a wonderful way of making everything seem good and bright and cheery. 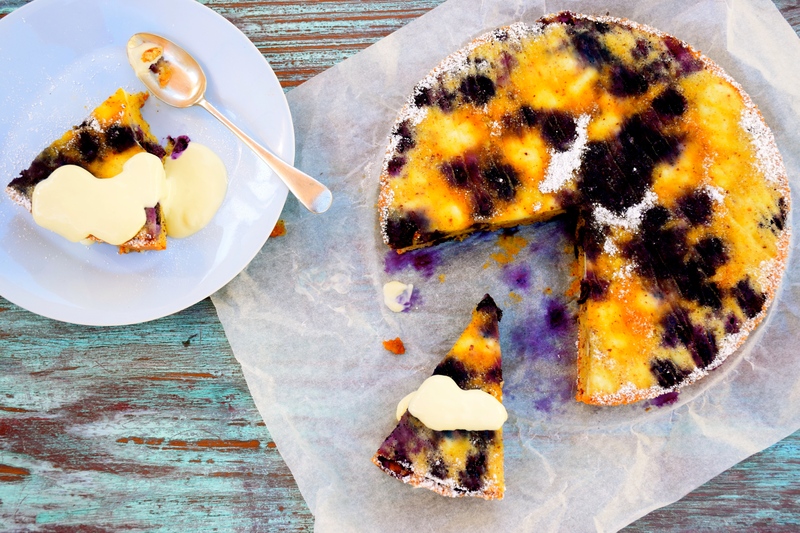 This upside down blueberry cake is light and fruity and not-too-sweet. Why is it an upside down cake? 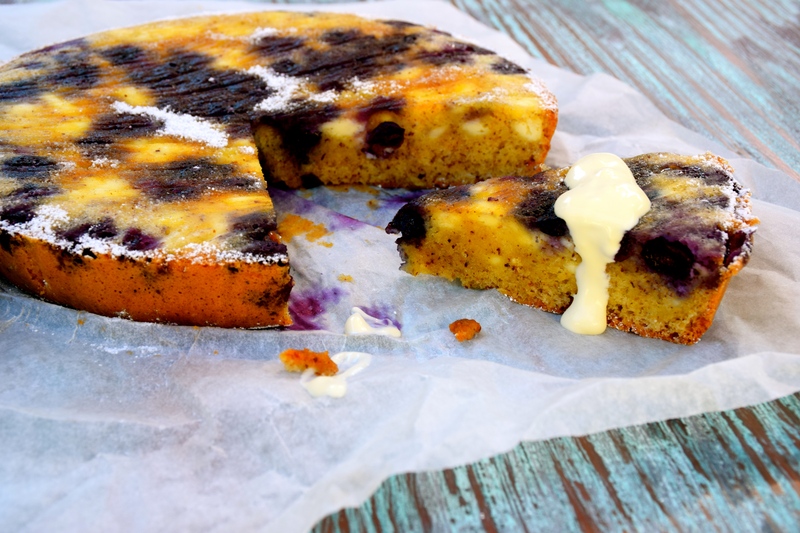 The blueberries sink to the bottom of the cake during baking so flipping it over onto a plate lets the dark purple colours shine through. It’s far prettier served upside down. The crumbled chunks of ricotta create little pockets of soft cheese that surprise and excite when you spoon into the cake and find them there nestled next to the tangy blueberries. Although i’d usually make this cake with almond meal, today I’ve used ground hazelnuts. But to be honest I think the almond is the way to go. You can be your own judge, and try either or both. Pre heat oven to 175C. Line a 22cm spring form cake tin with baking paper. Place the egg yolks and caster sugar in a medium bowl and whisk for 1 minute till light and creamy. Sift the flour and baking powder onto the eggs, add the hazelnut meal, zest of lemon, and melted butter, and whisk to combine. Meanwhile, whisk the egg whites to a soft peak. Add half the egg whites to the cake mixture and fold gently, add remaining egg whites and fold till combined. 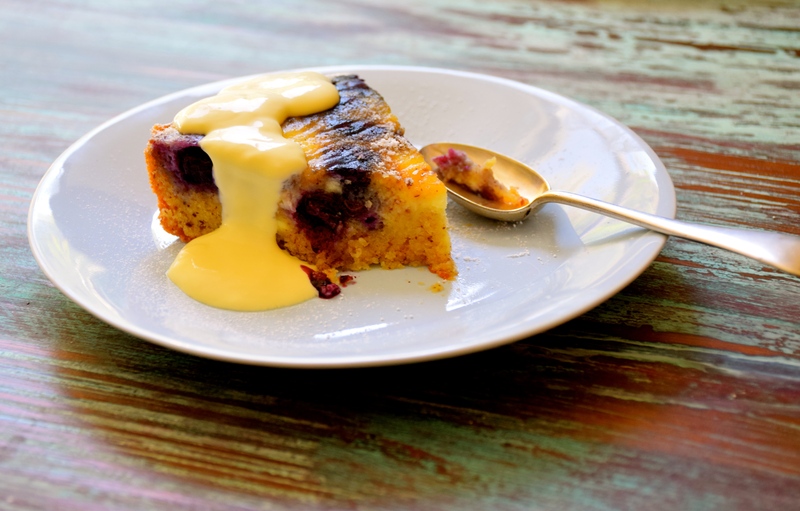 Finally, crumble to ricotta in large chunks into the cake, add the blueberries fold gently and pour into lined cake tin. Bake the cake for 40-45 minutes. Cool on a wire rack (don’t serve it warm, it’s better cold). To serve, place an upside down plate over the cake, flip it over and remove the base. Sprinkle with icing sugar and serve with thickened cream. wow. this looks superb!!! Love all of the ingredients, and the cream!!! Thanks, it’s a favourite around here. Ricotta really adds something wonderful to a cake- this looks lovely! It certainly does. I love combing savoury type ingredients into cakes as cakes aren’t all about being sweet.